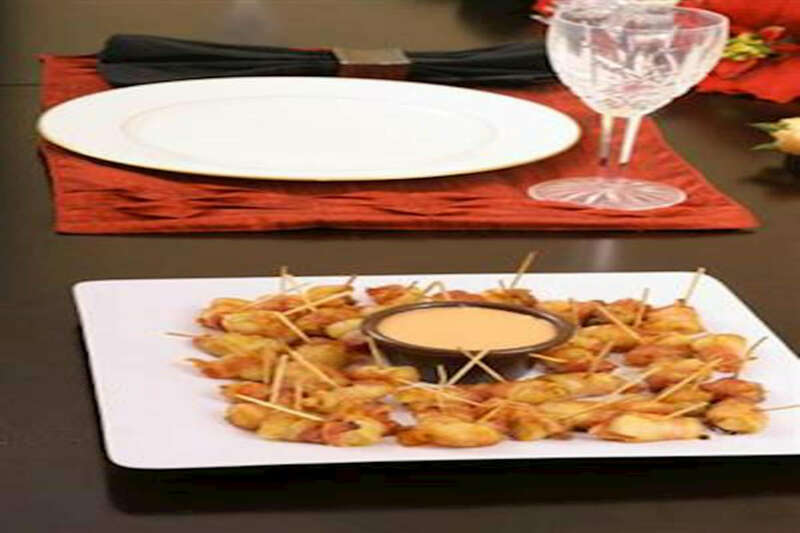 RecipeSavants.com Water Chestnuts wrapped up with bacon slices and dredged with ketchup-sugar sauce makes a delectable snacks to be served at teas and dinner parties. This simple recipe works best on its own. Smart Recipes, American Recipes, Pork Recipes, Recipes Pork American Bacon Wrapped Water Chestnuts PT35M Serves 4 Ingredients: 1 Can Water Chestnuts 0.5 Pound Bacon 0.5 Cup Sugar 0.75 Cup Ketchup Preheat oven to 375 degrees. Wrap the bacon slices around the water chestnuts and secure with the toothpicks. In a small bowl, mix together sugar and ketchup and cook till heated through. Coat the wrapped water chestnuts with ketchup mixture evenly. Transfer the water chestnuts to a baking dish. Bake for about 20 minutes.